The Minnesota legislature just approved a solar carve-out in the state’s Renewable Energy Standard expected to drive at least 450 megawatts of solar growth over the next seven years. 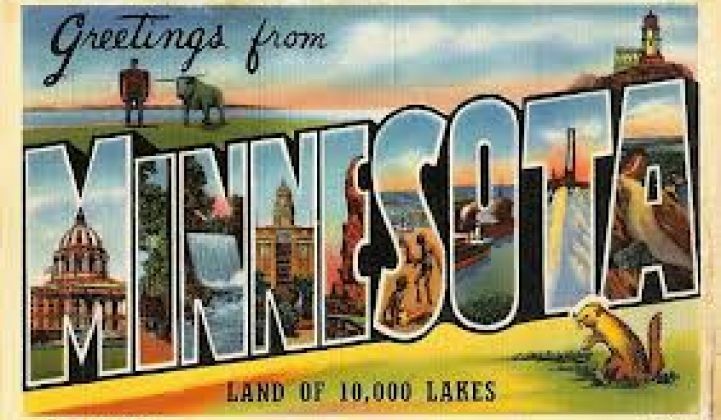 The new law requires Minnesota’s investor-owned utilities to obtain 1.5 percent of their power from solar energy by 2020. Of that, 20 percent must be from distributed solar systems of less than 20 kilowatts. 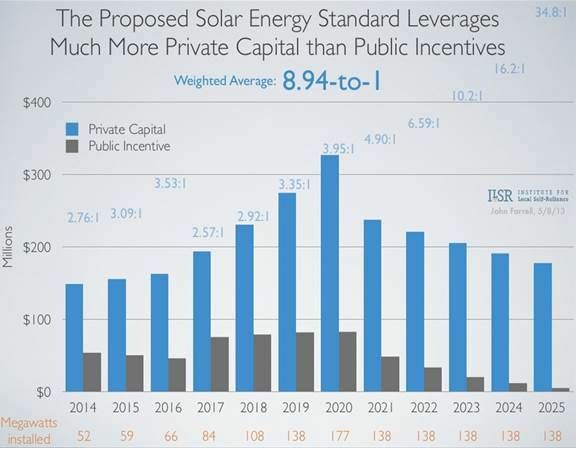 To drive solar growth, the law creates a five-year, $5 million per year fund that will pay performance-based incentives for ten years to system purchasers. The fund will come from payments by Xcel Energy (NYSE:XEL) of $500,000 per cask of spent nuclear fuel that it stores in Minnesota. 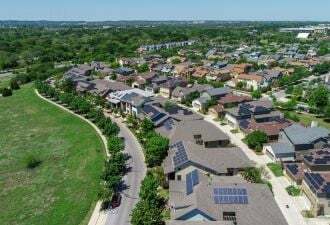 In answer to opponents of the solar standard, Institute for Local Self-Reliance State and Communities Energy Program Director John Farrell, one of the leaders in the drive for the new law, created a set of eight slides to illustrate its value. Below are three of his favorites and his thoughts about them. The solar standard will create about 1,400 installation jobs and about another 100 for operations and maintenance, Farrell said. Because the solar standard law includes performance-based incentives for ‘Made in Minnesota’ solar modules, about 20 percent of the new solar will likely be sourced from in-state manufacturers and the affiliated supply chain, Farrell added. He expects that to produce about 400 direct new jobs. That would likely produce about 2,700 indirect jobs associated with making components and providing services. Solar’s availability at peak demand times puts it in direct competition with fast-ramp natural gas plants, Farrell pointed out. The California Energy Commission’s cost estimate for building simple-cycle, spinning-reserve, gas-fired facilities like those Xcel would need to meet peak demand is between $0.28 per kilowatt-hour and $0.65 per kilowatt-hour, Farrell said. 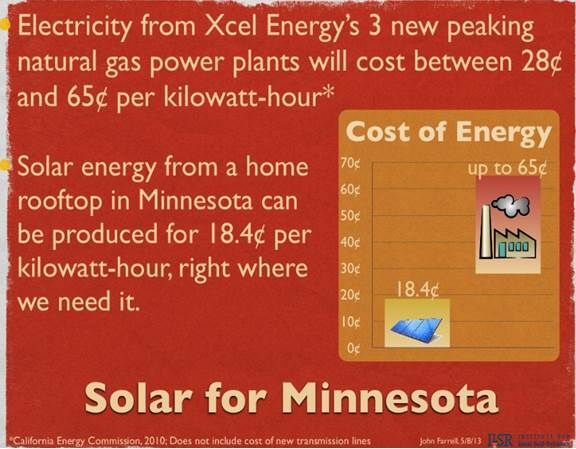 The cost of rooftop solar in Minnesota is $0.18 per kilowatt-hour. 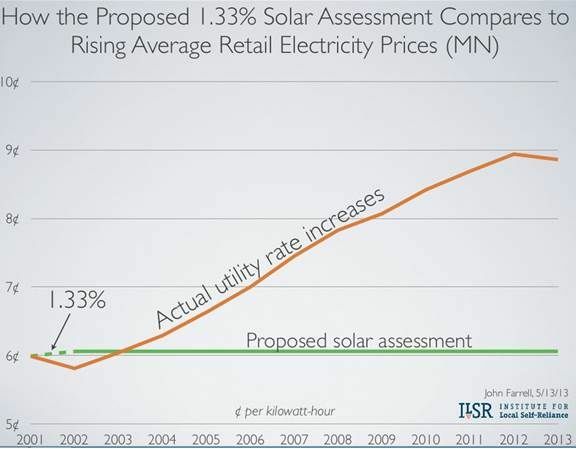 Minnesota utilities have been raising rates at 4 percent per year for a decade, Farrell said. Solar will hit parity and be competitive by 2020, when this solar standard ends. “A key part of the story,” Farrell said, “is that energy prices are not fixed. When we talk about changing the way we get energy, we are talking about a system that is constantly in motion, and generally that motion is upward price shifts. Solar fits in incredibly well because once the investment is made, the fuel cost is zero, forever."